The event was held on Tuesday 7 August at the University of Papua New Guinea (UPNG) and included a keynote address from Grahame Dixie, Executive Director of Grow Asia, a multi-stakeholder partnership platform that catalyses action on inclusive agricultural development in South East Asia. Mr Dixie said PNG can look to examples of South East Asian economies which have been able to kick-start their economic development by initially focusing on increasing the productivity of their smallholder farmers. “The world is changing rapidly – creating both challenges and opportunities for farming. Agribusinesses need additional supplies of agricultural raw materials to supply the changing, expanding, and largely urban demand,” he said. Mr Dixie pointed to a case from Indonesia, where a coffee industry partnership between a major transnational corporation, nurseries, fertilizer companies, NGOs, certifiers, banks and local traders has lifted farmers’ harvests and improved the prices they receive. He said this outcome was due to a combination of certification, competition and improved quality, and the tangible impact has been that around 20,000 farmers increased their coffee profits by more than 80 per cent - worth approximately US$12 million per year. “In PNG the approach of creating and working with multi-stakeholder partners – typically comprising agribusiness, producers, civil society and government – can bring similar benefits,” Mr Dixie said. The event also included a panel discussion that featured Jane Ravusiro, Senior National Coordinator at the Pacific Horticultural and Agricultural Market Access Program (PHAMA); Joeri Kalwij, the Manager of Monpi Coffee Exports Ltd; and Max Puritau, Global Village Exports Managing Director. The APEC Discussion Series at the Precinct will continue next week on Wednesday 15 August with a discussion centred on APEC Health Security Week and the theme ‘Ensuring the Region’s Health Security through Primary Healthcare’. It will feature a keynote address by World Health Organization Regional Director Dr Shin Young-soo. The series was launched in May and gives Papua New Guineans unprecedented access to visiting international experts and the APEC discussions taking place throughout 2018. 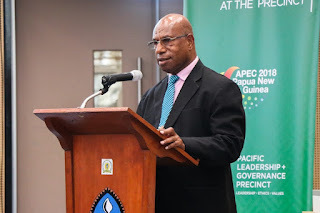 It is hosted by the PNG APEC Secretariat and the Pacific Leadership and Governance Precinct, supported by the PNG – Australia Partnership, and explores APEC themes and policy issues relevant to Papua New Guinea and the Pacific.